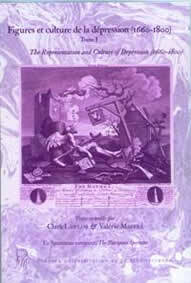 Before Depression - what depression was like before it was called "depression"
Selected papers from the conference have now been published as academic articles in two volumes of The European Spectator by the University of Montpellier (Presses universitaires de la Méditeranée, 2010) edited by Dr Clark Lawlor and Dr Valérie Maffre of the Université de Montpellier. 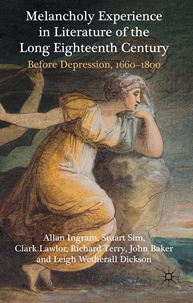 This book-length study of depressive writing and writing about depression in the long eighteenth century is edited by Allan Ingram and Stuart Sim, with chapters by Clark Lawlor, Richard Terry, John Baker, Stuart Sim, Leigh Wetherall-Dickson and Allan Ingram. Published by Palgrave (2011). 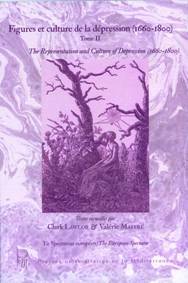 This full-length study of depression through the ages, exploring its continuities and discontinuities in the understanding and misunderstanding of the condition is written by Clark Lawlor and published by Oxford University Press (2012). 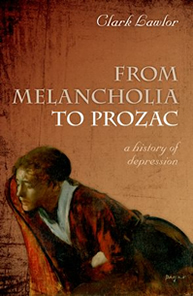 This is a four-volume set of primary materials, much of them unpublished since the eighteenth century, covering different aspects of attitudes towards, and the experience of, depression and melancholy during the period 1660-1800. It will be published by Pickering & Chatto in the summer of 2012 under the general editorship of Leigh Wetherall-Dickson and Allan Ingram. 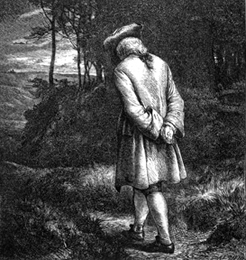 Selected lectures from the two series of public lectures, revised as scholarly articles, are being published in two special volumes of the periodical Studies in the Literary Imagination (Georgia State University) under the guest editorship of Richard Terry. They are expected to be available during 2012.